I volunteer at a cooking store in Bethesda every now and then called L’Academie de Cuisine. I’m not “living the dream” of quitting my job and becoming a full time chef (let’s face it people, dreams don’t usually translate well to real life), but working there as an assistant gets me some great exposure to different kinds of cooking along with meeting a wide variety of chefs. Recently I volunteered for a class under Christine Ilich in which we made some really great soups (which I will have to write about some time). She was great to work under and really emphasized variation and adaptation with cooking. We actually didn’t completely follow any recipe passed out to the attendants that day and the soups were still amazingly tasty. A true sign of culinary prowess. Christine had brought some vegetables from her personal garden for the class and some of them just weren’t used. I, never one to turn down free food, gladly took these off her hands (score). One of the things I took back with me were a couple of turnips. Turnips, it turns out, are part of the cabbage family. 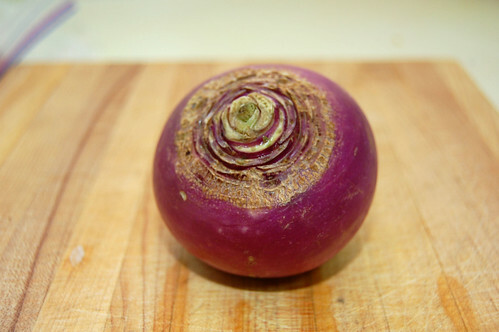 So if cabbage is the black sheep of my made-up lettuce family, then turnip is like the uncle that you never call. You never talk about turnip. You know he’s there, but you consider it a good year when you’ve minimized your time with him as much of possible. However, I am not one to waste food. Ever. Unless it is spoiling, by god, I will find a use for it! 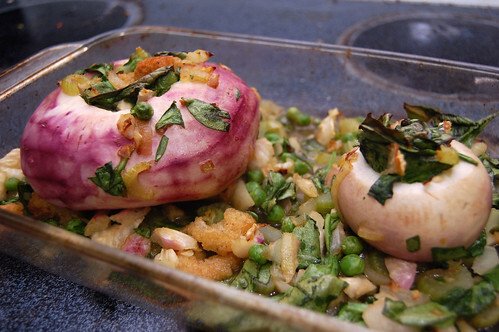 Smitten Kitchen has this excellent post for roasted stuffed onions. These things are amazing. I have often just eaten them as the main (and only) dish for dinner. Screw chicken, man, just give me another friggin’ onion. Inspired by Christine Ilich’s excellent soup variations and by Smitten Kitchen’s mouth watering onions, I decided to try my own adaptation. Looking back, I would have added some more seasoning. These things are good, but nowhere up to the level that is the roasted stuffed onions. Scrub the turnips. If old (rough, brown skin), peel them. Cut off the tops and bottoms, about a 1/4 to 1/2 an inch. Core the turnips using a melon baller (it’s really easy). Leave a 1/4 to 1/2 an inch thick wall. Try not to go through the bottom, but don’t lose any sleep over it if you do. Take the “innards” and roughly chop them, then combine with a 2 tablespoons of oil and 1/2 teaspoon of salt. Place on a baking sheet with the hollowed turnips and let roast for 20 minutes. Prepare a heat-proof bowl with the spinach, bread, stock and melted butter. Once the turnips are out of the oven, reset the oven to 350°F. 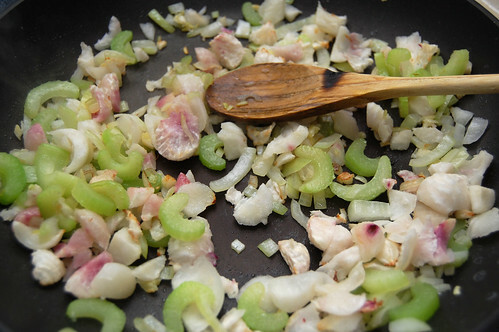 Saute the onion, celery, garlic and turnip “innards” until soft; approximately 5 minutes. Add to the prepared bowl and mix together. Stuff the turnips with the filling. If you have extra, no worries. Throw it in the pan as bedding. It’ll still be quite tasty. Roast the turnips for 20-25 minutes, until the turnips are softened, slightly browned.